Fertilizer » 12-12-12 » FEG-121212 - Surf the Turf! *5.1% slowly available Nitrogen from Methylene Urea. Triple 12 is a concentrated, water-clear solution containing an equal ratio of N, P, and K, as well as slow release nitrogen. 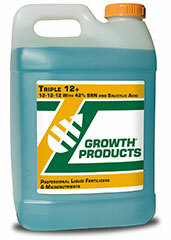 This equal ratio is a staple for agricultural, greenhouse and nursery crops. The solution contains 5% Slow Release Nitrogen from our exclusive Nitro-30 Methylene Urea. Methylene Urea is known to be a very consistent and reliable nitrogen source that remains present and available to your plants for a longer period of time. Methylene Urea is not easily broken down, and its nitrogen will only be released by a combination of factors (heat, humidity, and microbial activity). The slow release nitrogen is 'tackified' and is less likely to leach or volatilize. Triple 12 also provides a full 8 oz of Salicylic Acid in every gallon. Salicylic acid, the active ingredient in aspirin, triggers the plants Systemic Acquired Resistance (5AR). Research has shown that spraying this naturally occurring compound onto plants triggers natural defenses that keep harmful fungi, bacteria, and viruses at bay. Application rate: 1 to 4 gallons per acre or 1 gallon to 100 gallons of water. See label for additional rates.